Angels are divine messengers and celestial intermediaries that intervene between humankind and God. They take our heartfelt prayers to God and deliver God’s divine power directly to our consciousness to help us and support our specific needs. Amplify divine love and light within you—exactly what you need to help empower yourself. Overcome persistent health issues and life’s challenges. These angelic prayers have been divinely designed to help you consciously achieve a greater harmonic resonance and realignment with God. Your work with these prayers will enable you to greatly increase the quantity and speed of God’s divine power in your consciousness and life. 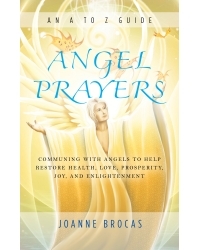 Joanne Brocas is an angel expert, divine healer, and best-selling author of The Power of Angels and The Power of Angel Medicine, with more than two decades of experience in angelic communication and healing. During her childhood, Joanne communicated with her guardian angel; she has maintained a strong, clear connection with the angelic realm throughout her life. She is a popular and regular guest on radio shows, her articles have been featured in some of the world’s leading healing magazines, and she is the healing columnist for The Other Side Press. Born in South Wales, Joanne and her husband live in Orlando, Florida. She teaches board-approved healing programs and workshops internationally and can be reached via her Website, www.joannebrocas.com.